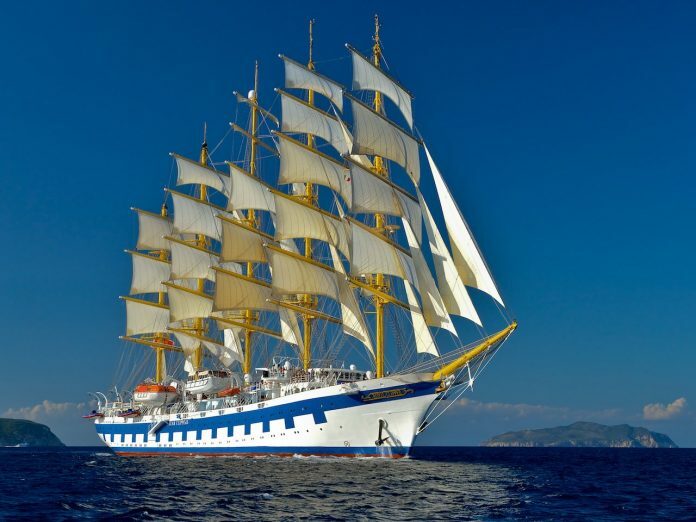 The Royal Clipper is the largest five masted fully-rigged sailing ship in the world and a Mediterranean cruise, from France to Italy, calling at Corsica and Sardinia, recalls the heady days of sail. I’ve sailed on luxury cruises before and, despite my best intentions, always end up a few pounds heavier. It’s not helped by the excursions which tend to be sedate affairs where you’re ferried around in buses. This time, since we’ll be calling at tiny ports, I vow to spend my shore days hiking the surrounding countryside. In addition, every morning I’ll be doing thirty minutes of yoga, a facility available to all passengers. 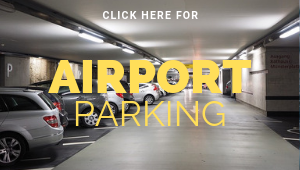 I arrive in Cannes after an easy thirty minute transfer from Nice Airport. The Royal Clipper is anchored in the bay, sails furled, and tenders are waiting to ferry me and around 200 other passengers to the ship. They’re younger than most cruise clients, probably because the ship has no lifts and there are stairs to negotiate. With everyone safely on board, we set off for Italy, using the engines, as there’s not enough wind for the sails. 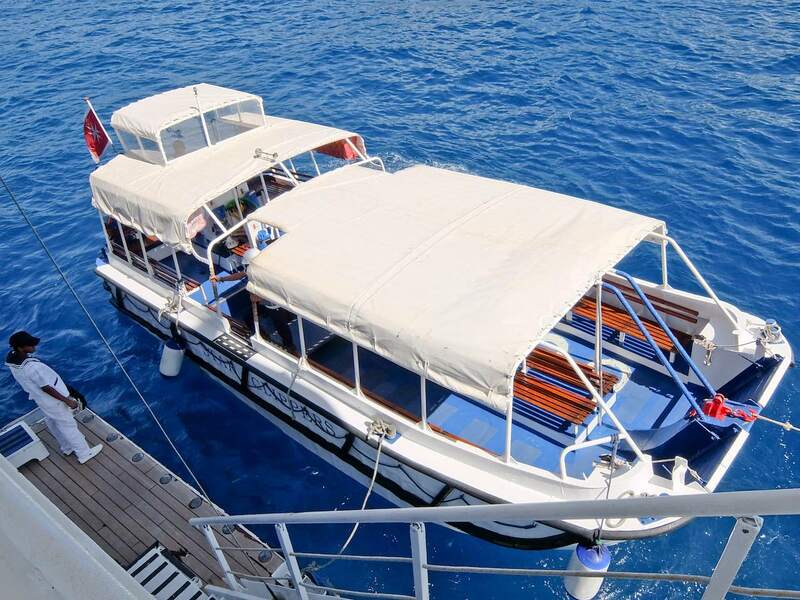 My spacious cabin is on the Commodore deck, almost at sea level, and it’s comfortably equipped with a large double bed, ample storage space and bathroom with shower, washbasin and toilet. Two portholes allow me to monitor the world outside. Dinner has waiter service and there are at least a couple of choices on a menu which includes appetiser, soup, sorbet, main course, salad, cheese and dessert. I’m not going to go hungry. Morning sees the coast of the Italian Riviera looming and I go out on deck and join around ten passengers for our first session of yoga. 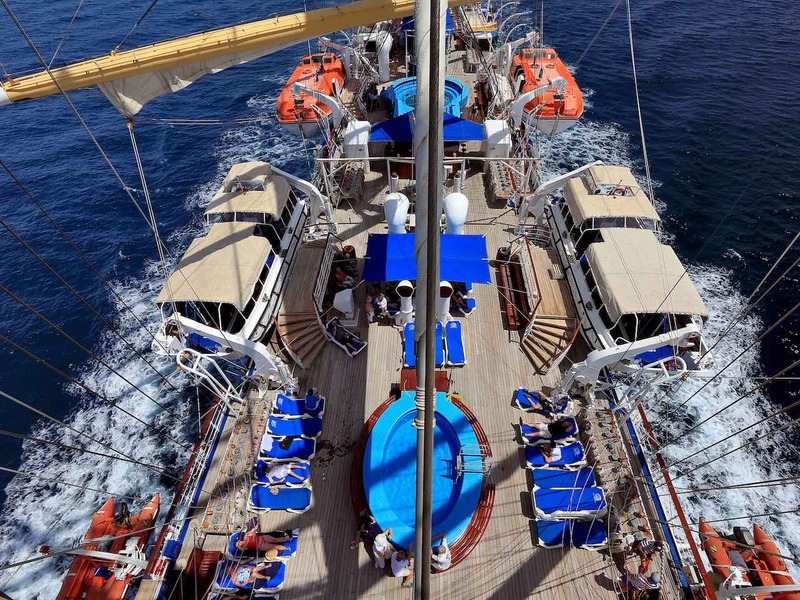 We pass Genoa, follow the Riviera di Levante and arrive at the attractive port of Santa Margherita Ligure. After a buffet lunch, I don my walking boots and take the tender into town. 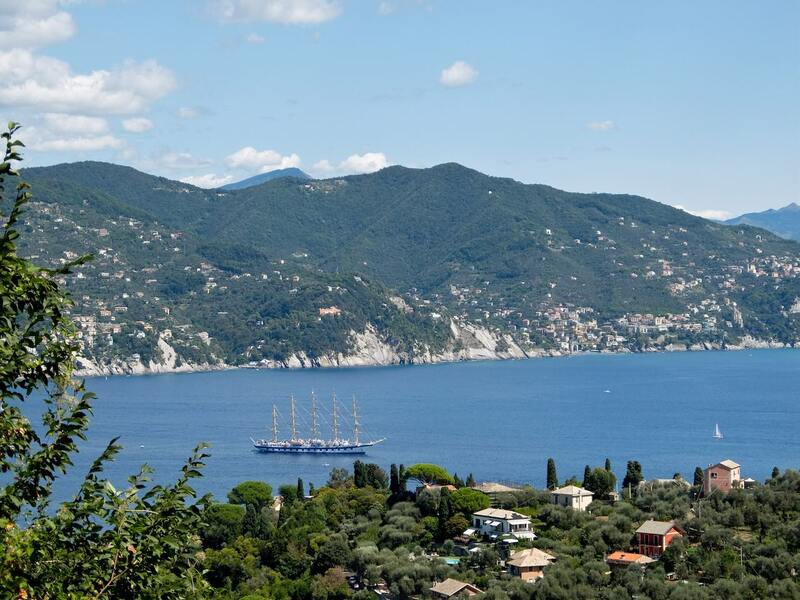 My plan is to hike up to hills above the town and follow the footpath to Portofino. It’s hot but I make my way up to Nozarego and get amazing views over the Gulf of Tigullio, the Royal Clipper sitting proud in the bay. From here I enter the Monte di Portofino National Park and its well signed path leads me through tiny villages before descending steeply to Portofino. The stunning horse shoe harbour, lined with pastel coloured houses, is dominated by Castello Brown on the hill above. Although a cluster of super yachts are moored in the bay, the piazzetta is strangely quiet, perhaps because it’s almost the end of the season. 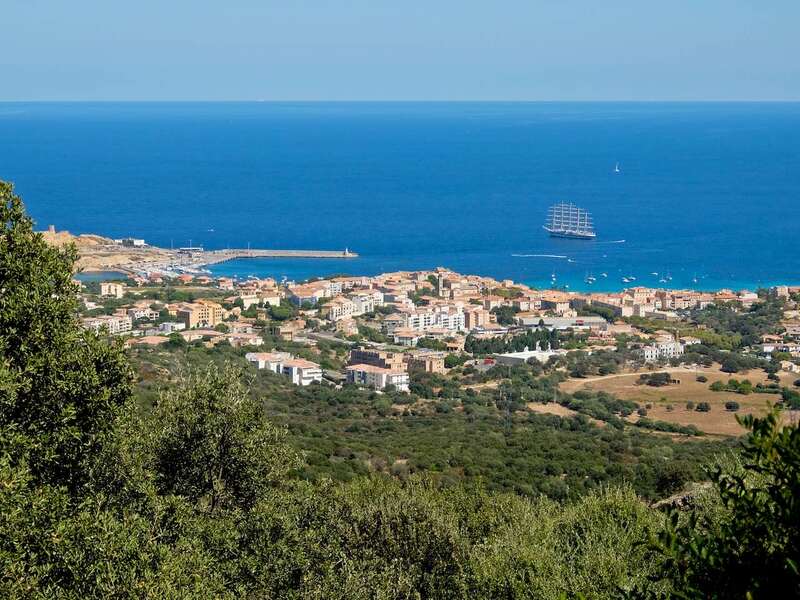 We sail overnight and next morning arrive in L’Isle Rousse on Corsica’s North West coast. The craggy mountains of the island’s interior provide a backdrop to the town but they’re too far away to tackle. The lady at the tourist office insists that there are no walks that start in town but I have other information. My guide book shows a ten mile trail which ends at a railway station further down the coast. After checking the timetable, I set out. The way is marked by yellow flashes and I climb steadily reaching Occiglioni, at around 400m, only a cluster of houses, before reaching the 9th century hilltop village of Sant’Antonino. It fully deserves its title as “one of the most beautiful villages in France”, its rectangular stark stone buildings silhouetted against the sky. From here I can see the railway line wriggling its way along turquoise coast below. Conscious of time, I pick up the pace, and manage to reach the station just before the scheduled departure of 4.45. I’m now beginning to worry as the last tender leaves port at 5.30 and there’s no sign of any train. The station is unmanned, with no information, so I set off to the main road to try my luck hitch hiking. Of course, five minutes afterwards, I hear the sound of the train arriving and see it vanish into the distance. It’s too far to walk all the way back to L’Isle Rousse and panic is now setting in. My thrusting thumb doesn’t work as nobody stops. Worse, my phone has died so there’s no way I can communicate with the ship. In desperation I approach a couple of parked cars and beg them to give me a lift. Fortunately the second family takes pity and drives me directly to the port. I make the final tender with minutes to spare. I celebrate my narrow escape with a large beer and regale anyone who’ll listen with the story of my escapade. Perhaps the story reaches higher command because next day, when I’m planning to leave the ship and join it later in Bastia, the purser says she has to check with the captain. After a hurried conversation, she tells me that he advises against it, as he says the road is blocked. I point out that I will be on the beach, following the shore so, grudgingly, he gives his permission. It takes around four hours to walk to Bastia, a picturesque town with a recently restored citadel, home to an excellent museum. This time the boat is moored at the port, so there’s no need for tenders, and I make it with plenty of time to spare. As we leave, all 42 sails are hoisted for the first time, to the sound of Vangelis. 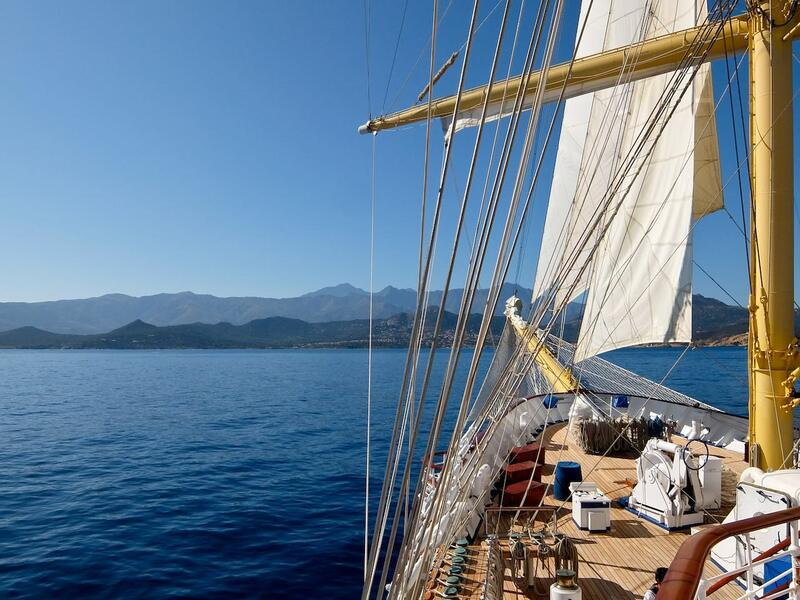 As we majestically make our way under sail towards Elba, I feel proud to be on board. Portoferraio, the island’s capital, is probably the most attractive town of the entire voyage. Narrow winding alleys climb up from the harbour to the double fortifications of Forte Falcone and Forte Stella, where there are glorious views from the 16th century ramparts. The Villa dei Mulini is where Napoleon lived during his exile here, before making his comeback at Waterloo, and his death mask rests in the Chiesa della Misericordia. No hiking today as I’ve signed up for a bike and kayak excursion. We cycle along the coast, dodging the traffic, for about an hour before reaching a beautiful bay. There we transfer to kayaks and, after paddling through sunken caves, pull up on a deserted beach for a swim. It’s an exhilarating morning, although I’m looking forward to the morning yoga to soothe my aching shoulders. 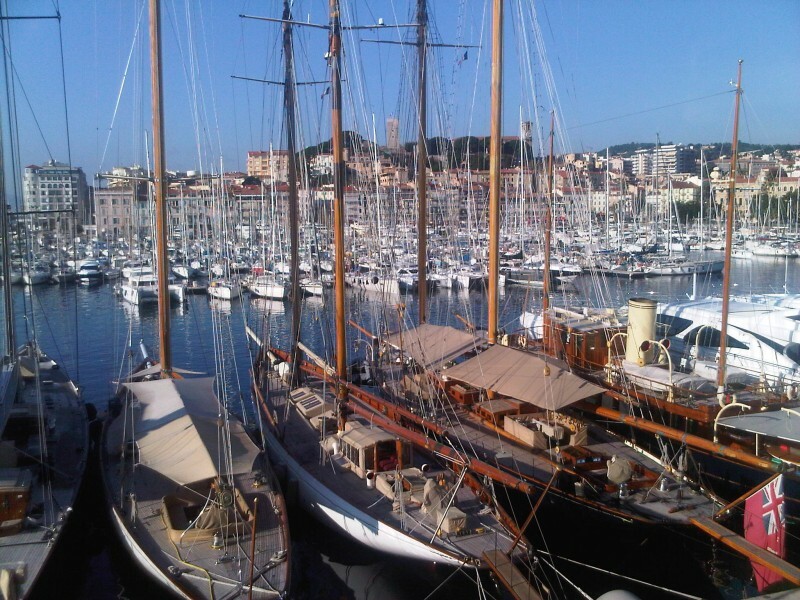 Overnight we sail back to Corsica and anchor off Portovecchio, standing proud above the port. The town is pleasant enough, but is almost entirely dedicated to tourism with souvenir shops, cafes and restaurants. I enquire about hiking trails but the tourist office tells me that I need to take a boat. Time doesn’t allow so I return to the ship. I have a similar problem next day at Porto Cervo in Sardinia, the capital of Costa Smeralda. The coastline was developed by the Aga Khan in the 1960’s as a playground for the rich and famous. In the harbour, I walk past designer stores, including outdoor showrooms for Rolls Royce and Bugatti, and there’s not a tourist office to be seen. I content myself by walking to the nearest beach and enjoying the crystal clear waters. It’s the final night on board as we make good way under sail to Civitavecchia, the port of Rome. My experiment of trying to hike a few miles every day has worked well. Even better, the mornings of yoga have eased my muscles. I’m convinced that the exercise has kept my weight stable. Unfortunately the scales back home tell a different story. 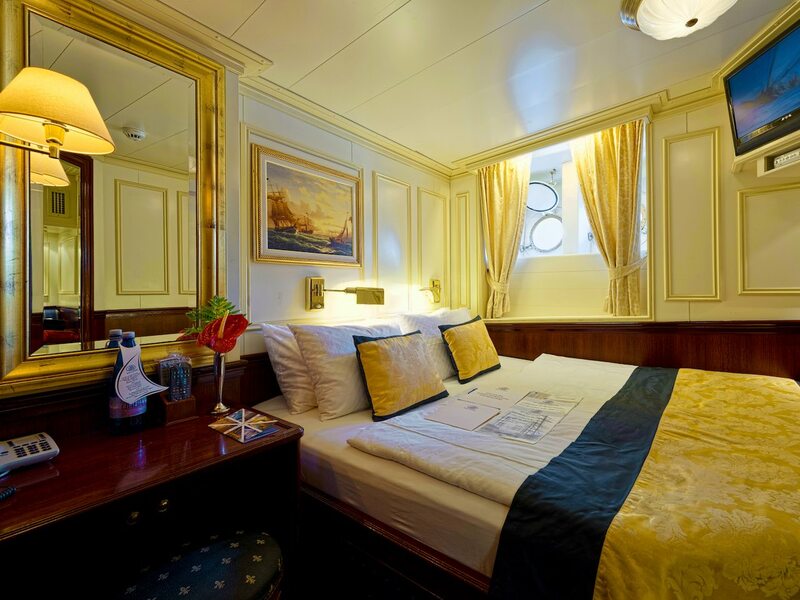 CRUISE: The next Cannes to Rome cruise on Royal Clipper, with the same itinerary, will take place from 8/6/19 to 15/6/19. 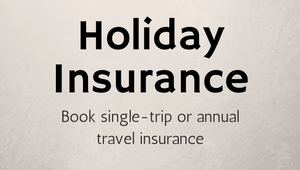 Prices start from £1645 pp. FLY: EasyJet flies from Gatwick to Cannes and Rome back to Gatwick.